I blame myself really. Which is probably a common reaction among those who have suffered at the hands of large institutions: this sense that we were somehow complicit in the madness which was visited upon us; that we should have known better. And it's not an entirely wrong reaction, because of course I should have known better. In fact, at the time, I did know better - indeed, I have always known better than to engage with anyone in a call centre about anything, especially any form of change. You know those guys who are always on the radio telling you that you're a fool if you're not "shopping around" for cheaper insurance or a better deal on your broadband, or who insist that everyone should know what "APR" means? 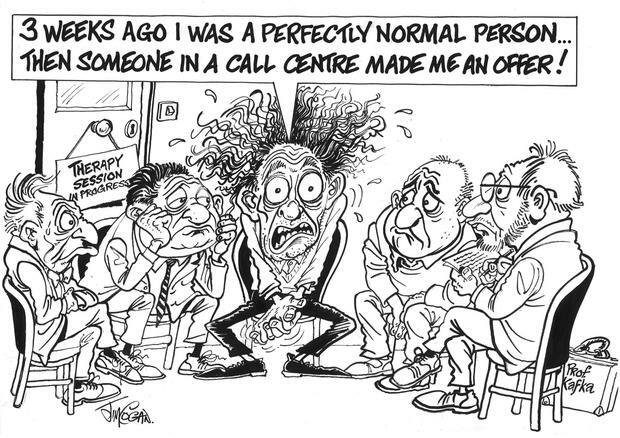 I am the opposite of those guys, because I know that if I were to attach any importance to their blatherings, I might some day find myself in long and exhausting conversation with someone in a call centre. And to avoid that, I would gladly pay whatever APR they're asking - and reader, I'd probably pay your APR too. So why did I do it? Why did I respond to that letter that I got from Eir, telling me something about the terms of the deal that I have with them, something about it changing? Naturally I only half-read the letter before disposing of it, for fear that it might contaminate the delicate balance of my mind. But it kind of nagged away at me, and so I went against all my better instincts, all the instincts I have accumulated in my life indeed, and I rang 1901. I was through to Eir. And after a while, I found myself talking to a person. She told me what her name was, but that doesn't matter.It wasn't as if I was going to be calling again, looking to speak to her personally, and even if I was, there would be very little chance of that happening anyway. So after another while, when I had given her more information about myself, she assured me that I did not need to be concerned about whatever was in the letter. And then she made the observation that since I had my home phone and broadband with Eir, but my mobile with Vodafone, it might be better all round if I changed the mobile to Eir. And so I found myself listening to her, as she outlined the potential benefits of this great new deal. And then I remembered the last time this happened, when someone from Eircom rang me up to offer me a great new deal on my phone and broadband, which due to a technical error on their part, resulted in me losing the broadband for about 10 working days - 10 of their working days at least, more in actual human days. So I stopped her right there, and I described that terrible experience to her, and I asked her to promise me that whatever she was trying to sell me here, would not complicate my life in any way. That however it turned out, I couldn't possibly find myself in a few days' time ringing this same call centre, and telling one of her colleagues about some problem that had arisen that I had already told other colleagues of hers about, on perhaps 15 occasions. She insisted that there would be no problem this time, and I kept listening to her, though I was doubting this with every fibre of my being. Eir sent me down a Sim card, and the Pin number and unblocking code which would enable me to begin my new life with them. Unfortunately these did not work on my Nokia phone, or at least they worked only up to the point at which another code was being sought, presumably to unlock the phone at the Vodafone end. (You will note that I have the older type of phone, not the smartphone, which used to make me seem out of date, until recently when people as advanced as David Beckham have declared that they are returning to the simpler device. So I was ahead of the game all the time). So now I need to ring the Vodafone call centre, to be told that it could take up to seven working days (they do love the working days) to email that unlocking code to me. And when eventually that code does not arrive, I call them again and they say they have passed this request on to Nokia. And when I "chat" online with Nokia, they tell me that, due to various mergers and the like, this is now the responsibility of Microsoft. The person with whom I am chatting provides me with a link for Microsoft. That would not be Eir or Vodafone or Nokia, that would be Microsoft. At which point I gave up. I summarise this chain of events as briefly as I can, leaving out parts that are too sad to relate - like when I went into an Eir shop to see if a new phone would work, and the girl who was most helpful, seemed to have cracked it until the moment that she tried to ring my number and we realised that the new phone only had the "temporary" number sent down to me by Eir. So there I was, cast out into a telecommunications void by the combined uselessness of Eir and Vodafone and Nokia and Microsoft, about three weeks after I had been told that none of this would complicate my life in any way - in telephone terms, it was starting to look as if I no longer had a life to complicate. Yet it was someone in one of these many call centres who finally got me out of the hole that they'd dug for me, by quietly giving me the number of a computer and phone shop where they do this sort of thing - speaking in that I-shouldn't-be-telling-you-this tone which you would normally associate with someone giving you directions towards the rooms of a back-street abortionist. Still, she had sent me to the right place. They got it done in two days (two working days, if you insist) for €20 - with what, at that stage, seemed the minor downside that all the numbers I had stored in the phone were gone. And so I'm thinking if a couple of lads down a side street in a provincial town can do this "unlocking", you'd think some of the great corporations of the world might be able to manage it. But then you'd have to think about them in the first place, and you don't want to do that. Because sure as hell, they're not thinking about you. Declan Lynch There was a pretty good joke on Twitter a few weeks ago about Michael Jackson. I don't recall the name of the person who made it, but it went something like this. Declan Lynch For all those who were wishing him well on his retirement from 2FM, there were only happy memories of Larry Gogan. For me it was not so simple.